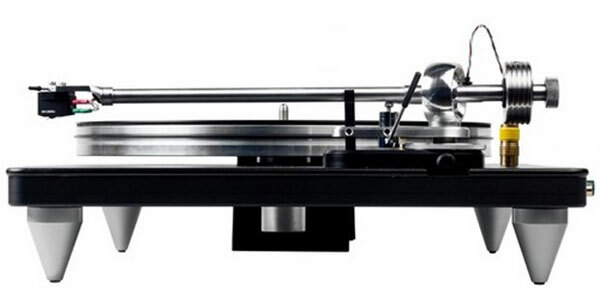 STARTED BY HARRY and Sheila Weisfeld way back in 1978, VPI has become a household name amongst vinylphiles for its range of record cleaning machines and rather tasty vinyl spinners. 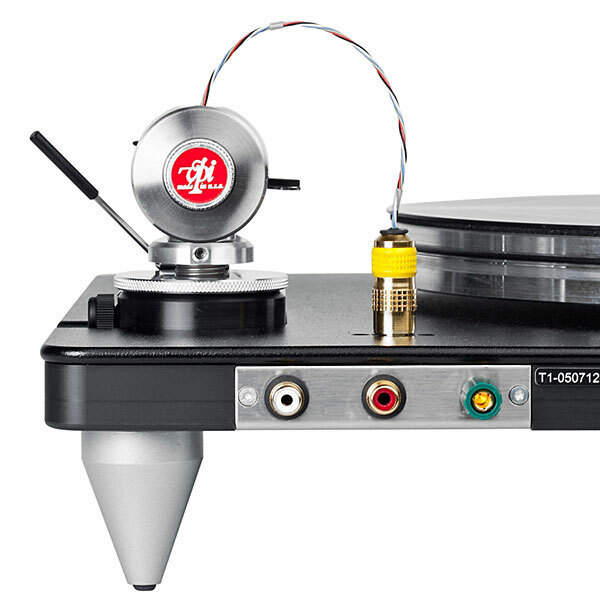 It’s the record cleaners that placed VPI on the hi-fi map, but Harry’s engineering bent got the better of him, and he soon turned his considerable talents to the production of plattenspielers, starting with the now classic HW-19. 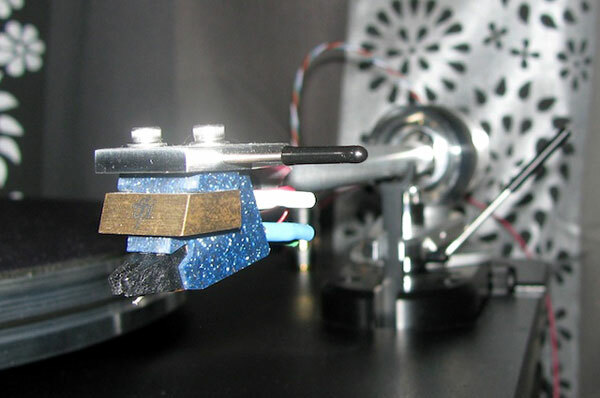 A good-looking turntable, this conventional belt drive design used an aluminium platter and a conventional plinth supported by springs in each corner. The ensuing years saw the introduction of the Scout, Aries, TNT and Classic series along with the mighty HR-X flagship. This review however, is pointed squarely at the entry level, with the introduction of the all-new Traveler, the logical baby brother (or sister) of the Scout and Aries series. It’s VPI’s new entry level offering, and was inspired by the memory of Sheila Weisfeld, who sadly passed away in 2011. In some ways, the Traveler is a modern update of the original HW-19, although the form factor (and probably performance) is more upmarket and current than that of its illustrious forebear. The Traveler uses a solid delrin and aluminium plinth supported on four chunky rubber tipped aluminium cone feet, with an ‘underslung’ motor assembly on the left hand side of the turntable. This housing contains the 600rpm AC motor and necessary on/off switch, although once turned on you’d probably never turn the Traveler off, as the cloth mat atop the platter has a pattern that ‘dances’ as it rotates – a kind of optical illusion. And there is the associated insomnia you’re likely to have once you start spinning vinyl: “Just one more record, okay honey?” Just try turning the Traveler off. You have been warned. The platter is an exquisitely machined circle of aluminium damped with stainless steel for resonance control, and once carefully placed on the platter post all there was to do was to screw the spindle on with the included spanner wrench. Once done, it was an easy job to attach the black synthetic belt – this ‘locates’ within one of the grooves on the outside platter rim so belt slippage is nigh on impossible. 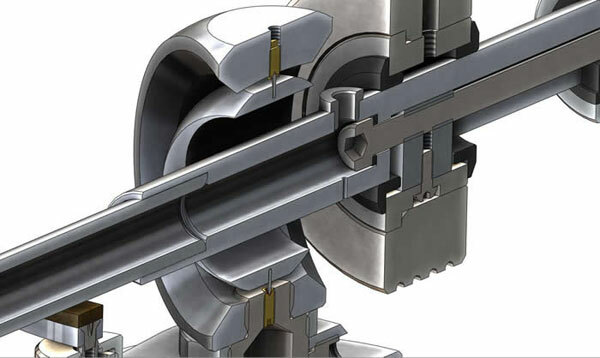 The 10-inch tonearm is a work of art in itself. VPI has designed an all-new arm especially for the Traveler, and rather than use their legendary unipivot knowledge, they have opted for a conventional gimballed design utilising sapphire bearings. Constructed of a mixture of stainless steel, aluminium and delrin, the arm features a captive headshell (with arm lift) and arm tube wiring directly attached to a connector on the plinth, terminated at the rear of the chassis with fine quality RCA sockets. 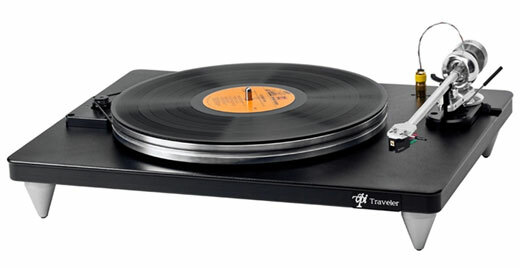 The review Traveler came with the tonearm attached to the plinth (thanks to Neil of Turned On Audio) so all I had to do was add the platter, level the table on my Serious Racks sandbox, and I was ready for action. Oh yes – cartridge. Neil had kindly mounted a rather superb Soundsmith Zephyr moving-magnet pickup (now that’s an old term – thought I’d use it one day) and its 2.5mv output proved perfect for use with the phono stage I used during my listening sessions. I decided to eschew my main system for an exquisite second system for this review – Antique Sound Labs Wave 8 tube mono/TX-1 DT passive pre, Audio Innovations P1 tube MM phono stage and Omega Super 3 XRS hemp-cone single driver floor standing loudspeakers. Cables used were mainly Nordost (Superflatline mk2 speaker cables/Blue Heaven interconnect from phono to pre) with help from Audioquest (Traveler – phono stage). This isn’t a big bickie hi-fi system, but its sound quality simply astounds. I thought the system would be a perfect foil for the talented Traveler, and I knew I’d hit a home run when I listened to the first track. All components were sited on a Sound Creations Sonata rack (sand-filled steel tube with glass shelves – gulp), the Traveler sitting proudly on top of the aforementioned Serious Racks sandbox. Room dimensions were (and still are afaik) 4m x 4.5 approx. You’ve probably already guessed that I was impressed with the baby VPI. That’s a bit of an understatement, as it delighted with every album that graced its perfect aluminium/stainless steel platter. Tracks from Ernest Ranglin’s Memories Of Barber Mack were full bodied and expressive, basslines plumbed the depths without sounding overblown and fluffy, while all-too precious midrange detail was as clear as a bell. Instruments were easily picked out of the mix (Ranglin’s guitar, for instance) with realistic timbre and believable dynamics. Leading edges of drums and plucked strings were startlingly real sounding, as were the piano sounds. Speaking of piano sounds, I detected no wow (a slight slowing/speeding up of piano notes) while playing piano music via the Traveler; this is a common issue with vinyl replay, but the outstanding VPI sailed through in this regard. I’ve been flogging Marvin Gaye’s What’s Going On recently, not because I’m getting old but because of the fabulous music contained on the album. On 180gsm vinyl it sounds simply outstanding, and so it did through the Traveler – Marvin’s plaintive, soulful vocal took precedence over the other performers on the record, but they were likewise easy to follow from song to song. ‘Inner City Blues’, for instance with its Bootsy Collins-inspired ‘The One’ bass riff is a masterpiece of understated soul, and the little VPI laid the recording bare with an open and honest performance of this much-covered classic. I don’t seem to listen to much basic rock for some reason these days, but I decided to slap Foo Fighters’ Wasted Light on the platter for a wee spin. This album was recorded entirely in the analogue domain in Dave Grohl’s garage at his home in California, and it has been described as the band’s most ‘raw’ and ‘fierce’ to date. I thought it’d be a good test for the Traveler, and so it was: the turntable literally grabbed the music by the balls and thrust it out of my poor little Omega’s in a very electric and grungy fashion. Guitars, snare and kickdrum, cymbals and screeching vocals all shone through convincingly with a quite excellent display of vinyl sound quality. ‘Dear Rosemary’ features Bob Mould on guest vocals: the slowest track on the album, it was a particular delight with its expansive, crescendo-packed sound, with not a jot of artificial harshness or compression from the system. Nice review Gary. The Traveler notches up another stellar review on it’s belt! Any thoughts on how it would match up next to the WT Simplex in terms of sonic ‘signature’ and value? I haven’t heard the Simplex to be honest (Ash Kramer owns one), so I can’t compare them sonically – they are bound to have a different tonal quality though. Both spinners are from highly reputable so it’ll come down to personal taste. Ash heard the Traveler at the Witchdoctor gtg (get together) we held at the end of last year, I’m pretty sure he was impressed although it was in a system he hasn’t heard before. ..unfortunately I couldn’t get to that GTG. Nothing beats hearing gear with your own ears, in your own setup. Sure I could be very happy with either! Yep it was a great day, and there will be others. Keep posted Ben, once I’m back from my time at sea I’ll organise the next gtg. Great fun!